Following quickly on the heels of my Bunny Pull Apart Cupcake Cake, I just had to share these gorgeous (and easy!) 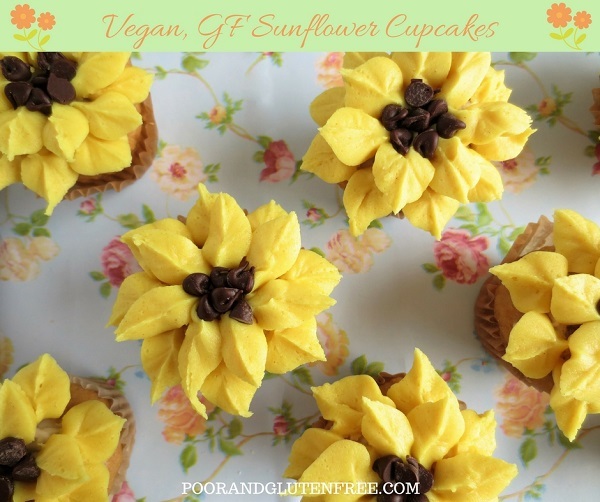 gluten free and vegan sunflower cupcakes. 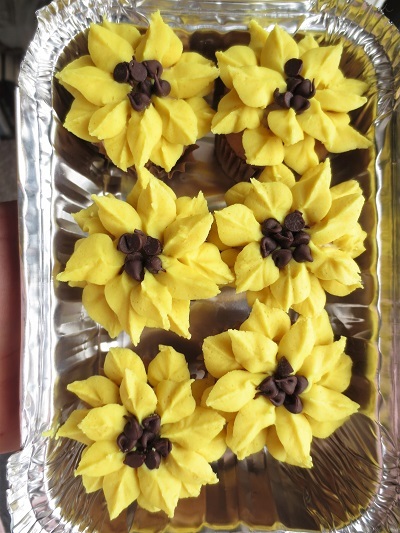 I think of these bright little cupcakes as little bombs of sunshine. They make me stupidly happy to see them when I open the fridge (which is where you'll want to store them). I'm confident that if you show up at Easter dinner with these, the recipients will reward you with big smiles. And don't let the icing daunt you! 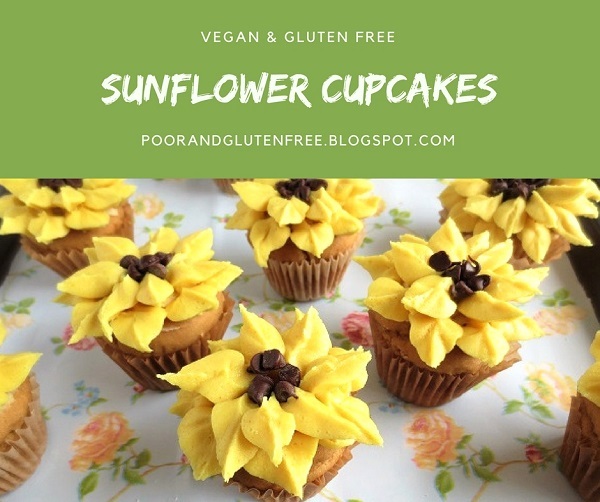 Though the buttercream sunflowers look complex, I only had to do one tester cupcake before I felt confident enough to work more quickly. In the end, I couldn't tell which was the tester. Even if the petals don't seem perfect as you're piping them, never fear. Nature isn't always perfect and symmetrical either! The cupcakes can be made large or mini - I made mine mini, because I like bite-sized ones. As such, the supplies I suggest below are for mini cupcakes. Optional: pretty contact paper to line a baking sheet for presentation. I got mine at the local dollar store. I didn't actually stick the paper to the sheet. See below for details. 1/2 - 1 tsp ground turmeric, or more as needed to achieve desired color. Don't worry, this won't really taint the flavour of the buttercream. 1. Cream the butter with a hand blender or spoon until smooth. Gradually add in sugar until incorporated. Beat in vanilla, then add water as needed to make a stiff, smooth icing. Add turmeric as needed to achieve desired color. 2. Scoop icing into piping bags with a leaf tip, #366 fitted onto it. Dab a small amount of icing in the centre of a cupcake, and smear with a knife. I didn't bother spreading this over the entire cupcake surface, just the centre. This will help hold in your chocolate chips. Then make the flower petals. Working around the edge of the cupcake, hold the tip at a 45 degree angle to the cupcake and squeeze icing against the cupcake, then pull away and relax pressure. Create 2 rows of leaves. For mini cupcakes, you'll have just a small space left in the centre. Press 6 or 7 mini chocolate chips in the centre. Chill cupcakes to set icing and keep stored in the fridge. If using contact paper and baking sheet: cut contact paper to fit inside the baking sheet. Dab some buttercream icing on the underside of the contact paper on the four corners, and smooth over the sheet. Dab icing on the bottom of each cupcake then press them onto the contact paper to help hold them in place if you're moving the cupcakes around at all. Since I made these as an experiment before Easter, I had a lot more than I wanted to eat all on my own. Therefore, I carefully packed them 6 apiece into little aluminum loaf tins and passed them on to my in-laws. The reason I had so many was because I also trialed this Bunny Pull Apart Cake. If you use the recipe to make the 24 mini cupcakes, you'll end up with more than enough to make both the pull apart cake, and 13 sunflower cupcakes. 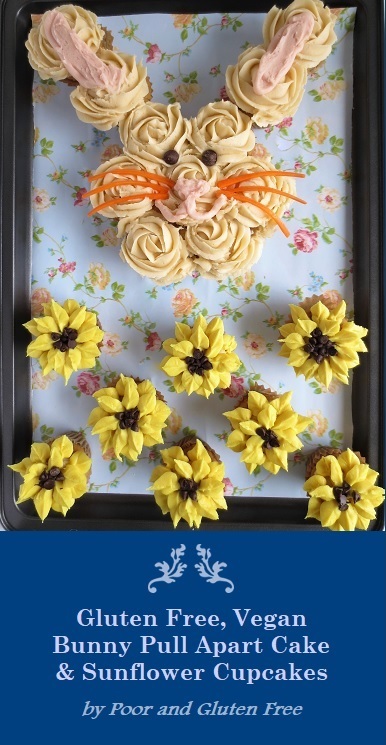 Tip: If you decide to make both the sunflower cupcakes and the bunny pull apart cake, you don't need to double the icing amount. I made 1.5x the recipe and had just enough. (i.e. 3/4 cup vegan butter, 3 cups confectioners sugar, etc). I set aside a few Tbsp for the pink icing (to make the bunny nose and ears), and then divided the remaining in half. One half was colored with turmeric, and the other left plain. 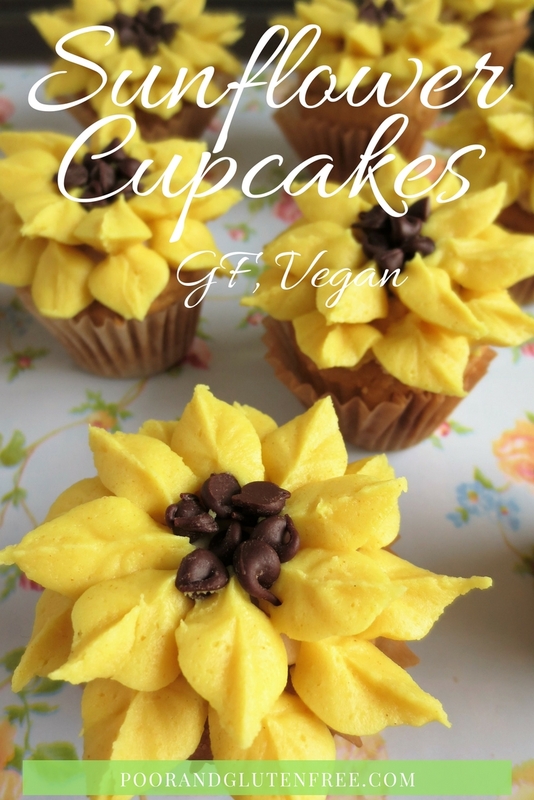 Check out my compilations of easy gluten free Easter treats and baked goods!